First of all, thank you to everyone who contacted Japan Zone asking if we were okay or with offers of help or refuge. Each and every one was much appreciated. I and my family are all fine and we are staying put and doing our best to carry on as normally as circumstances will allow. To everyone who has bought a Supporting Japan t-shirt, please know that your donation to the Japanese Red Cross Society will very soon be helping those most in need in the Tohoku region. Thank you. Japan Zone is based in Nagoya in central Japan. We certainly felt the huge earthquake on March 11 and it was quite frightening in its persistence. But no real damage was done and there were no injuries let alone deaths in this region. As scale of the disaster became increasingly apparent, I and many others here in the Nagoya foreign community felt we had to do something to help. The t-shirts are one way we are contributing, and in downtown Nagoya last night I took part in a packed meeting of people either carrying out or planning various initiatives to help the relief efforts. I also helped organize a bicycle donation drive and we shipped a 2-ton truck of bikes to Tohoku, where they are an important lifeline for people in evacuation shelters. Japan Zone is a very small operation (okay, it’s basically just me!) and there is a limit to how much can be done in any given 24 hours. So for the time being, entertainment news updates are going to be put on hold while I try and focus my energies on, well, more important things. But if there is anybody out there who feels they could do the updates on a voluntary basis, let me know and we’ll see if we can work something out. American singer Cyndi Lauper (57) says she will go ahead with her planned Japan tour in spite of the recent disaster. One of the more genuine pop stars of her generation, she is as much a fan of Japan as its people are of her. She donated generously to relief efforts following the Great Hanshin Earthquake in 1995 and has already announced plans to raise funds at her upcoming shows. Lauper was scheduled to land at Narita International Airport shortly after the biggest earthquake ever measured in Japan struck of the northeast coast on Friday afternoon. Her flight was diverted to the U.S. Air Force base in Yokota, where she landed about 10pm. From there she transferred to a flight to Haneda Airport in the capital. Chaos in the city was such that she finally reached her hotel at 4:30am. Her schedule is due to start on March 15 in Nagoya and head to Tokyo for shows at the Orchard Hall on March 16-18. With the capital now enduring rolling power blackouts, her shows will also encourage fans not only to donate to the relief effort but also to conserve electricity. Also due to land in Tokyo last Friday were British heavy metal giants Iron Maiden, whose flight was diverted to Nagoya. The band released a statement expressing their regret over having to cancel two shows due to “obvious safety concerns towards the audience, the artist and the venue.” Singer-songwriter Jack Johnson has postponed four Japan dates that were due to kick off today in the city of Sendai, one of the worst hit by the earthquake and tsunami. By now, the whole world knows about the death and destruction that hit Japan yesterday afternoon. 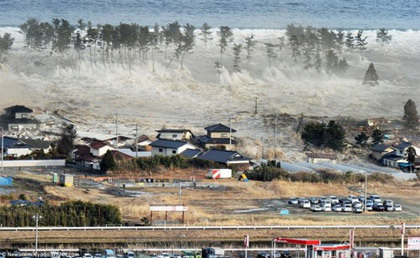 Japan Zone is located in Nagoya, Central Japan and a good 800km from the worst hit areas. We most certainly felt the earthquake shortly before 3pm, and it was prolonged and frightening. But this region and western Japan suffered no deaths or major damage. Tokyo and the Kanto region were less lucky, with scattered damage, injuries and even a few deaths. Public transportation was paralyzed for hours and many people spent a bitterly cold night on the streets or trying to get home. There continue to be power outages and life will be disrupted for some time. But the real story, the terrible tragedy is in the Tohoku region of northern Japan, in particular along the Pacific coast. A steady barrage of tsunamis washed away whole communities and the death toll is likely to be in the thousands. One particularly shocking report told of 200-300 bodies being washed up on a beach. And a major ongoing fear is the damage suffered by nuclear power plants on the coast of Fukushima Prefecture. A deterioration of that situation could have deadly consequences that would dwarf what we’ve seen so far. So, thank you to those who have contacted us to express your concern. We urge everyone to do and give what you can to support the relief efforts that will continue for some time. We have yet to figure out any way Japan Zone can contribute other than offer our support to existing groups. If you have suggestions, let us know. As I write this I am in the park watching my young children play and thankful that, this time, we are far from the devastation. But I am also in touch with friends and colleagues as we try to figure out how best we can help. Life goes on in much of Japan, though our hearts and thoughts are with those who have died, suffered and lost so much. This country is strongest when something brings the people together. This is such a time and the Japanese people will rise to the occasion, and we will be standing beside them. Sakagami Jiro, one of Japan’s most popular postwar comedians, died yesterday morning following a stroke at a Tochigi Prefecture hospital. He was 76. 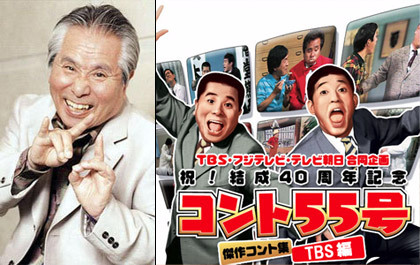 “jiro-san,” as he was popularly known, and Hagimoto Kinichi (69) formed the comedy duo Conto 55-go in 1966. Sakagami was born in Kagoshima Prefecture but spent most of his early years growing up in Japanese-occupied Manchuria before returning home to attend school. At the age of 19 he won a regional song competition hosted by NHK and headed to Tokyo to pursue a singing career. He went through several jobs before turning to comedy. Like many young comedians of the time, he honed his skills in Tokyo’s strip clubs. It was there that he first met and performed with Hagimoto, though it would be several years before they formed a duo and found success, first on stage and then in the formative years of TV comedy. In the early 1970s he branched out into acting, and landed a leading role in a TBS detective series in 1974. Sakagami first suffered a stroke while playing golf in 2003. Fortunately one of the other players was a doctor and immediate hospitalization saved his life. He underwent rehabilitation and made a full recovery nine months later. In 2005 he released his first original song in five years, and opened a school for young comedians in Tochigi. In 2006, he followed in Hagimoto’s footsteps and became manager of an amateur baseball team. He suffered another stroke last August and was hospitalized for several months. He was scheduled to give a stage performance this New Year, but that was canceled as he felt it would be unprofessional to take the stage in a wheelchair. Nakamura was arrested in April 2010 when Tokyo Metropolitan police found a small amount of “kakuseizai,” or stimulant drugs, in his parked car in Nishi Azabu. They later found quantities of marijuana and cocaine and drug paraphernalia when they searched his home. 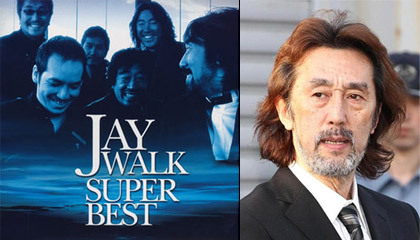 One of Japan’s premier rock bands, Jaywalk debuted in 1981 and had their first major hit with “Nanimo Ienai – Natsu” in 1991. That single sold 1.8 million copies, earning the band an appearance on NHK’s annual “Kohaku Uta Gassen” New Year’s Eve concert. They have remained active over the last two decades, but their most recent single was in February 2010, before Nakamura’s arrest. He was previously arrested in 2007 for having an army knife in his car, in violation of the Firearm Control Law. A couple of celebrities taking a walk down the aisle, figuratively speaking, for the second time this week. Talento Henmi Emiri (34) and actor Matsuda Kenji (39) got married yesterday, an auspicious “taian” day in the traditional calendar. Shortly before registering her marriage, Henmi met with her mother, singer Henmi Mari (60), and no doubt they discussed how best to avoid yet another divorce. Emiri, whose brief marriage to fellow talento Kimura Yuichi (48) ended in 2008, came from a broken home. Her mother split with actor Saigo Teruhiko (64) in 1981 and remarried a jewelry designer in 2001, but that also ended in divorce in 2005. Matsuda is best known for his 2005 role as the bike-riding action star Kamen Rider Hibiki. He and Henmi met last May when they worked together on the stage production “Wana.” By August the weekly magazines were reporting that they were living together. They are hoping to have a wedding ceremony in June. Meanwhile, management for tough guy actor Takeuchi Riki (47) announced yesterday that he tied the knot last November 11. His new bride is a 37-year-old ippanjin who is also a divorcee. The couple didn’t have a wedding ceremony and have no such plans. Takeuchi and his former bar hostess wife of six years split in January 2006, and he is said to have met his new love at a Christmas party in 2009. Both have a child from their previous marriages but it isn’t known who has custody. Takeuchi is best known as the star of the “Minami no Teio” (King of Minami) series of yakuza movies, straight-to-video releases referred to as “V-cinema.” Last year, shortly before he married he announced a whole new series, written, produced by and starring Takeuchi, who also sings the theme song. In “Kage no Koshonin – Naniwa Ninjo Retsuden” (Shadow Negotiator) he plays a former cop who bends the law to bring bad guys to justice. He has appeared in somewhat more mainstream films as Miike Takashi’s “Kikoku” (Yakuza Demon, 2003) and “Battle Royale II” (2003). 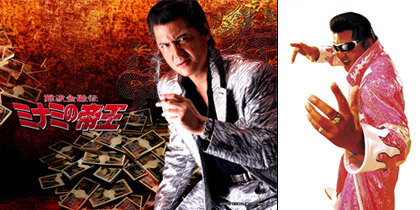 In recent years he has also taken on the role of his Elvis-like “twin brother” Riki (photo right), a flamboyant showman. 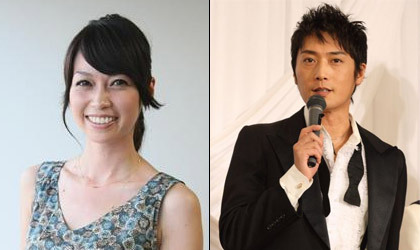 Actress Kikuchi Maiko (36) and her entrepreneur husband (42) have been divorced since last December, according to today’s issue of women’s weekly “Shukan Josei.” The two met in January 2007 and were married six months later. Kikuchi gave birth to a baby girl in March 2008 and was back at work the following October. Management for Kikuchi say that the couple were separated for about a year and a half, while the magazine article cites the causes as her husband’s womanizing and trouble with her mother-in-law. Kikuchi has custody of their daughter (2). The article also mentions a fraud case involving her husband and a man who claims he was swindled out of ¥30 million. Kikuchi’s management acknowledged the case but say it surfaced after the divorce settlement. Kikuchi is best known for her role in the 1996 NHK drama “Futarikko” (photo), which also made stars of the identical twins Mikura Mana and Kana (25). U.S. hard rock legends Kiss have made a sudden postponement of their upcoming Japan tour. The band, currently touring the world on the back of their successful 2009 album “Sonic Boom,” were scheduled to play seven shows in six cities here from April 13. Tickets were due to go on sale March 12, but that has been put back indefinitely. Tour organizers Udo said simply “due to the artist’s schedule, the tour has been postponed.” There has been a mention on Kissonline.com, the band’s website, of the shows and possibly some additional dates being rescheduled for the autumn. 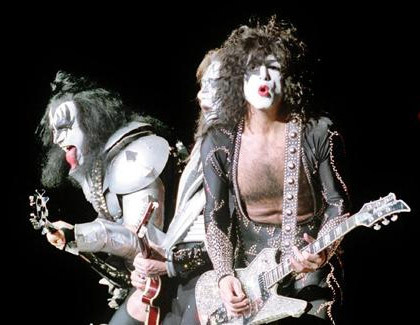 Kiss, who’ve been going since 1974, were due to tour Japan for the 10th time and the first since 2006. “Sonic Boom” was the band’s first original album in 11 years and entered the U.S. Billboard charts at No.2. A host of stars, including two of rock’s more colorful characters, shared the stage at yesterday’s “Asia Girls Explosion” fashion/music event in Tokyo. The center of attention at the Yoyogi National Gymnasium was X Japan leader Yoshiki, who organized the event along with unconventional fashion producer JayFR, the man behind the “Tokyo Girls’ Collection.” With over 11,000 in attendance, yesterday’s show was a crossover between Japanese and American culture. In addition to the top European fashion models lined up to show off the Yoshikimono line, the rocker invited: actress Momi Kaori (59, photo center); model Tominaga Ai (28); “90210” stars Shenae Grimes (21), Jessica Stroup (24), and AnnaLynne McCord (23); actress/socialite Olivia Palermo (25); and American shock-rocker Marilyn Manson (42). 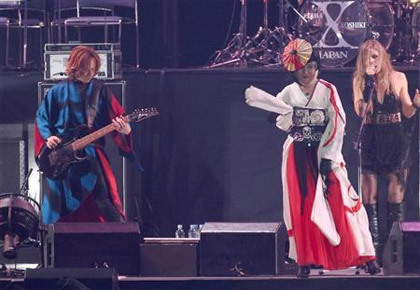 The event also featured Yoshiki modeling his own kimono design and playing guitar for the first time in several years. He performed five X Japan numbers, including the latest single “Jade” and the first performance of “Scarlet Love Song,” the theme tune for the upcoming anime feature “Tezuka Osamu no Buddha – Akai Sabaku yo, Utsukushiku.” There was also the first public performance in Japan by Yoshiki’s side project Violet UK (photo), with support from X Japan guitarist Sugizo (41).